Ammi Phillips (1788 Colebrook, Connecticut--1865 Western Massachusetts) began his artistic career around 1811. He was a limner: a nonacademic, often itinerant, portrait painter. Phillips seems to have been entirely self-taught, and he traveled extensively. Limners thrived in the United States in the first half of the nineteenth century, after the American Revolution and the great push to tame the wilderness, when there was more money, more leisure time, and more demand for art. Although many limners have not been identified, Phillips’s career was traced through the careful research of Lawrence and Barbara Holdridge, assisted by Mary Black. The artist’s paintings have since achieved an astonishing degree of renown, partly because of their distinctive stylization. In Phillips's mature style, one may discern the simplification of geometric forms sometimes verging on abstraction, in addition to the sophisticated use of a limited color palette. The artist's black on black technique is particularly distinctive. 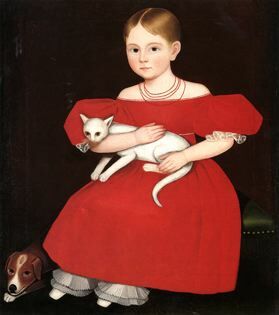 Yet, each element of a Phillips portrait is readily identifiable, and the sitter’s personality is evident. This unique combination of abstraction and realism sets Phillips apart from his contemporaries.